Imagine finding out that your child - or a child that you love dearly - will die without an organ transplant. Terrible, terrible news to receive. Then imagine, if you even can, that the doctor tells you to go home. That there's no hope. That you will have to watch your child die a slow death. They will do what they can and, in the end offer palliative care... but with only 25 people on the registry, there's really... no hope. This is a reality for many, many families in Japan where there are so few people registered as organ donors. Imagine, again, finding out that your child - or a child that you love dearly - will die without an organ transplant. Devastating news. Then imagine the child's doctor telling you - "Wait, there's hope!!" He tells you that you can begin to fundraise for a trip to America. It will require huge personal sacrifice, the help of an entire community. He explains how it would work. He (or she) would likely make a trip to the United States to make doctors there aware of your child and the need for an organ at some point. Lay the foundation, if you will. If your family does not have health insurance in the United States (most do not), then you would need to raise $3.5 million dollars for travel and medical expenses. You may need to stay for many months - you will likely have to charter a plane with life saving medical equipment like ventilators - and it's very possible that you may need to come back to Japan just to return to the United States if an organ doesn't become available. He will explain to you that UNOS (United Network for Organ Sharing) has regulations where only 10% of organs on the transplant list can go to patients that are outside of the United States. Once the quota is filled, you would have to wait until the next year. So you are faced with finding a way to fundraise $3.5 million dollars... care for a child with serious medical issues... in some cases, parent other children from afar while you travel to a distant land to save one... and try - in a country devoid of hope when it comes to organ transplants - to hold on. Both scenarios are dreadful when you come right down to it. But, unfortunately, this is happening right now in the beautiful country of Japan. This past Saturday afternoon I had the distinct honor of participating in a (yet to be named) documentary that is in the works about organ donation. 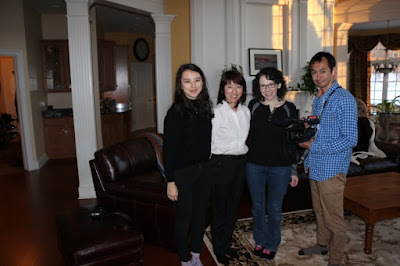 A film crew from Japan - yes, as in all the way from Japan - came to our home to talk to me about our journey with organ donation and to, quite frankly, stun me with statistics that made me realize that this is a veritable crisis in their country. On average in Japan, there are 50 adult transplants in one year. Shocking, right? But wait... it gets worse. There were 15 transplants total in the last six years for kids under the age of 18. Can you imagine that? But wait...it gets worse. Really, really worse. There were 4 donations for children under six years old in the last six years. Only four. Imagine if you were the parent of a child and you weren't able to get a transplant in your country... and you weren't connected enough to raise millions of dollars to bring him to a country that might save him. Just imagine. Clearly, something needs to change. And hopefully this documentary will be a great start. It is set to be released in Japan in May. I'm hoping to get my hands on it (with subtitles!) so I can share it with all of you. Eri and Taichi started work on this documentary three years ago and, since then, have followed the story of another Japanese child. His name is Hinata and he is five years old. His family was also able to raise enough money and Hinata received a heart from a boy who lived in Alaska. Before they came to meet me in my home, they were in Anchorage to deliver a video message to the donor family from Hinata's family. I am sure that was an extremely emotional moment. I was eager to sit down with Eri to understand more about why there are so few registered donors in Japan. I did my own research on the internet ahead of time, but it's better to hear first hand from someone who really knows. The things she told me were illuminating... and jaw dropping. In Japan, they have a hard time understanding "brain death." In order to donate organs, one must be declared brain dead. But when you're sitting by a bedside and still feel the warm skin and hear the beating heart and see the rise and fall of the chest of the person you love - it's hard to understand that they're truly gone. Many believe their loved one can come back from brain death and want them kept alive for as long as it takes. If the person is to die, they want it to be because the heart stops beating on its own. This would mean that all the organs would shut down and be rendered unusable for donation purposes. Another really huge pitfall that was mind boggling to me is how they determine the "cause of death" if one chooses donation. If someone who was brain dead was left alone and their heart stopped beating on its own (on average that takes about ten days, they found) - the cause of death would be considered "brain death." But if a person chooses donation for a loved one who was brain dead, the cause of death would be considered "donation." I was told that people who register as donors or choose donation for their loved ones - especially a child - rarely talk about it. It's not like it is in the United States where we seem to take great pride in doing kind and altruistic deeds and are happy to share about it with others. In Japan, it's almost taboo. And after hearing the cause of death situation - I can understand why!! It almost seems like you are handing over your loved one to be "killed" by a doctor for their organs when they list the cause of death as "donation!!" I can completely understand why they would view it the way they do. This has to change. Tonight, as I was tucking Brian in, we were talking about life and school and the future and what he wants to be when he grows up (he doesn't know). He asked me what I wanted to be when I grew up (ha!) and I told him that all I ever really wanted to be - my whole life - was a Mommy. Everything else I did was fun and fine but it was all just to kill time until I could be a Mom. That nothing makes me happier than doing things with and for him and his sister. Then he asked me, "Do you feel sad that you can't be Gavin and Darcy's Mom anymore?" Oomph. I told him this: Every time I write on my website something that might help someone... or every time I raise money for a cause that was important to Gavin and our family... or every time I talk about organ donation... and especially every time we include Gavin and Darcy in our conversations and plans... I am actively Mothering them. I'll always be their Mommy - but I sometimes need to feel like I'm BEING their Mommy. So the other day, when that film crew was here to interview me? That made me feel like I was actively being Gavin's Mommy - and the Mommy to all of these sick children in Japan who need a voice right now. His response? "Woah. That's really good." So when I sat on my couch and looked into Eri's kind face and she asked me to talk about Gavin and our journey to organ donation, I felt happy. I knew that Gavin was in the room with us. The words came out of me before I could think too much. It's a heartbreaking - soul crushing - story, Gavin's. But it needs to be told - over and over again. Each time I tell it, I know I'm sharing something new. Something important. Each time I tell it, I learn something new myself. I told Eri how choosing to donate Gavin's organs was really the only choice. The alternative - to let him slowly die and allow his organs to fail and watch his body change dramatically until he was no longer "Gavin" - seemed cruel. Cruel to him... and cruel to us. It also felt selfish. Gavin, in our eyes, was clearly sent to us to teach and to help and to inspire - not just his family, but all of those who came in contact with him in any way. To stop him from continuing on his journey to help people would have felt dishonorable. I explained the detailed and precise way that "brain death" is determined - and how it left no question in our minds that Gavin was truly gone. Choosing organ donation was our way of honoring his life - and honoring him. I asked Eri and Nina how the Japanese view cremation. I was so fascinated to learn that many Japanese people have a cremation ritual that is quite profound. They cremate only the flesh and keep the bones. (I don't know how that's done - but you can read more about this type of funeral here) Then, the relatives and loved ones sift through the ashes and pick out the bones with chopsticks. Nina explained that this is a way to honor their body - they hold up each bone as if to say "Ah, look at this healthy bone!" before placing it in the urn. Instantly, I thought of the irony. I wonder if they could view organ donation the same way! If they could imagine their loved one being wheeled into surgery a hero. If they could imagine the surgeon picking out each organ and praising it as healthy and strong and still having a divine purpose in life before "placing it" in another person where it could likely save them. If only they could see how much honor there is in saving other people's lives. I went on to explain to Eri how I told Brian about organ donation. How I told him that our bodies are like suitcases. We fill our suitcases with our favorite and most valuable things to get them all safely to our destination. But when we get there, we don't have a need for our suitcase anymore! Well, our body... including our organs... are all part of our "suitcase." Inside that suitcase is our immortal soul - the thing that makes us who we are. When we die, we have no need for our body anymore. But our soul never dies! That is why he understands that Heaven is all around us. Gavin and Darcy and Pop and everyone he loves that is gone - their souls are all around us. Eri seemed a bit nervous to ask me one question. She wondered how I felt about Japanese families fundraising to come over to get their child a transplant. She explained that the Japanese often feel guilty - like they are "taking" organs from American people who are also waiting on the list. (Even though it is all monitored under UNOS and follows a very strict protocol.) I wondered if she thought I would be upset - feel outraged - but I felt none of that. I mean, listen - I am a donor Mom. I don't at all - for a second - know what it feels like to be on the other side of the hall as a Mom of a child waiting for a transplant. But I do know this: If I had a child who needed a transplant to live - and I lived in Japan - I would either MOVE or fundraise. I don't blame anyone for one second for doing anything and everything they can to save their child. I would (and tried to) do the same exact thing. This blog post may not change too much in Japan - except maybe a mind or two of a Japanese person reading this. (There are, according to my stats, over 2,000 readers of Chasing Rainbows in Japan!) If that happens, I would feel like Gavin saved yet another life. Truly. Hopefully, when the documentary comes out, I will be able to share it here to get it in front of more eyes - and, God willing, change many, many more minds. But I do know that I am honored, truly, to be a small part in helping to make a change in Japan. Are YOU an organ donor... wherever you live in the world as you're reading this? If not, I hope this post - and Gavin's journey - has inspired you to register. You can easily register if you live in the United States on the UNOS website. Or search your country or region and "how to register to become an organ donor" online. It doesn't take long. I always say, most people can't relate to something until it hits home. Please - register to become an organ donor before the next person who needs an organ is someone you love. As I tell my children - we are all connected. Thank you Kate, for sharing your message of hope. Hope for a life, hope for a life time. You are an amazing woman!